The Sportful Men's Super Total Comfort Bib Shorts offer the best in muscle support, moisture-wicking performance, and padding for long days in the saddle. This premium short forgoes a traditional knit fabric in favor of a stretch woven with 29% Lycra. By doing so, it increases muscle support and moisture-wicking comfort, both of which are crucial when you're touring long distances and besting your previous century ride time. And although this stretch woven fabric is thin, it actually provides increased coverage with 30% less weight than a comparable knit. Featuring the most padded chamois in Sportful's lineup, this bib short has an integrated Total Comfort Chamois for maximum padding and comfort. This chamois uses continuously variable closed cell urethane foam that ramps up to 18-millimeters at its thickest point, combating saddle soreness and fatigue on the longest rides. Helping to combat sweat build-up along the lower back, a mesh insert was added for a cool, airy feel when you're pushing your limits. Its flat leg gripper uses a silicone dot pattern to prevent the short from riding up. There's also a radio/media pocket located at the back bib for storing your favorite media player. Other features include 2 to 1 flat woven bib straps for a secure, pinch-free fit, as well as flatlock stitching to reduce irritation and chafing on longer rides. 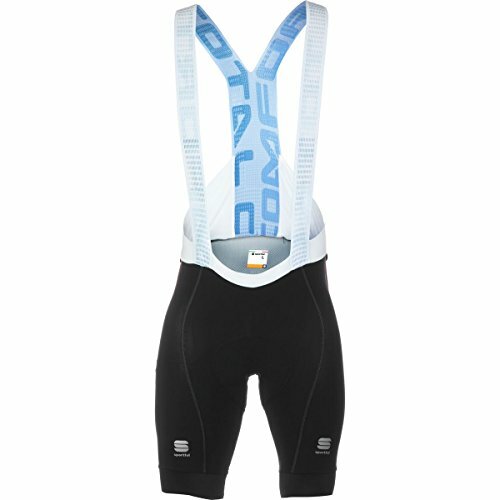 Oh yeah, we forgot to mention that this bib short was crafted in Italy with superior attention to detail. If you have any questions about this product by Sportful, contact us by completing and submitting the form below. If you are looking for a specif part number, please include it with your message. Urbann Boards "Neil Peart Signature Shoe, Black-Gold 10"